Jharkhand NEET Counselling 2018 for 85% state quota seats is expected to be conducted in the 2nd week of June 2018. Through the Jharkhand NEET centralized state counseling, candidates will be granted admission into MBBS/BDS courses in the various medical and dental colleges of Jharkhand. Counseling for 15% All India Quota seats will be organized by Directorate General of Health Service (DGHS) on the behalf of Medical Counseling Committee (MCC) of India whereas NEET centralized counseling in the state of Jharkhand will be conducted and managed by Jharkhand Combined Entrance Competitive Examination Board (JCECEB). 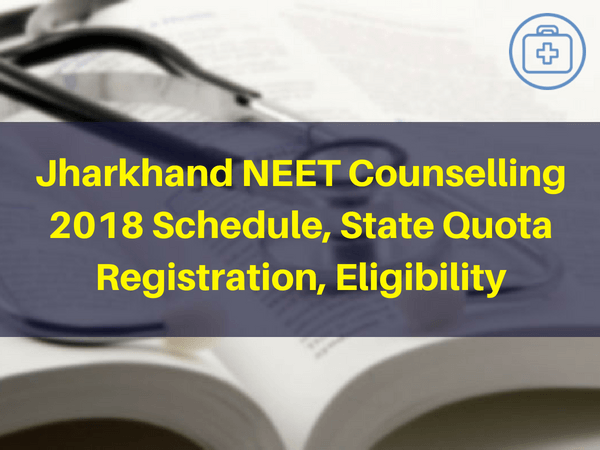 In this article, we have shared all the important details related to Jharkhand NEET state quota counseling 2018. It will include details like- Counseling schedule, eligibility, procedure, registration, documents required etc. Candidate must be an Indian national to be eligible for Jharkhand NEET 2018 state counseling. Candidates must have attained an age of 17 years on and before 31st December 2018. Lastly, the candidate must have qualified NEET 2018 exam and his/her name should be there in the merit list. Candidates have to visit the official website of the JCECEB, Jharkhand (mentioned above). Now candidates have to register themselves by filling all the required details. After registration candidates have to fill all the personal details asked in the form. Once candidates have filled all the details, they have to upload photograph, signature and thumb impression. Now candidates have to make payment of the counseling fee. After the final submission, they have to take a printout of the application form. The first step in UG counseling involves online registration. Candidates have to register through the official website of the Board. The second stage is the release of merit list. On the basis of the merit list candidates will be called for counseling. Candidates will be notified of the counseling date, time and venue through the website. On the day of counseling, candidates have to be present at the counseling venue with all the required documents. On the basis of merit, document verification and choice filled, seats will be allotted to the candidates. After the allotment of seat candidates have to report to the allotted college with all the documents. The second round of counseling will be organized only if there are vacant seats or if there are candidates who have not been allotted any seat in the first round. Jharkhand NEET state counseling will be conducted tentatively in the month of June 2018. As soon as Board will release the counseling dates, we will update the same here. Candidates will be intimidated about Jharkhand NEET Counselling through the local newspaper and also through the official website of the concerned authority. It is mandatory for the candidates to be present at the counseling venue. Candidates are advised to be in touch with the official website of JCECE Board to get the regular updates about the Jharkhand NEET centralized state counseling. Candidates can contact the counseling authority through the contact details given below in case of any issue related to counseling. Is there any chance of getting mbbs seat in Jharkhand if my neet score is 396 in UR category.